Pi-KAA! 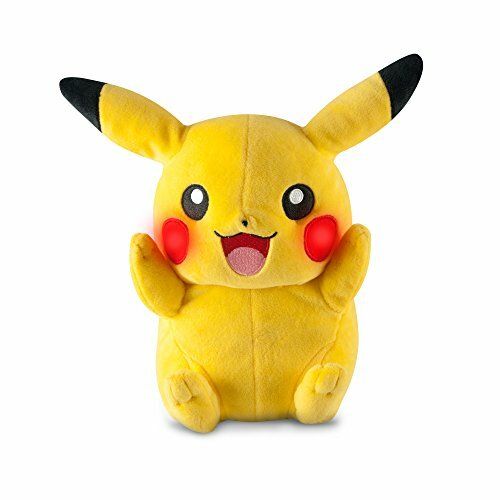 With 10 sounds, light-up cheeks, and moving ears, this Pikachu is surprisingly durable. Just be sure to switch it from ‘demo’ to ‘on’ to hear all the sounds. 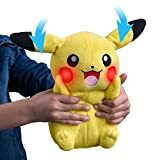 Sure to please Pikachu fans, this electric mouse has 10 different sounds and phrases, light-up cheeks, and moving ears. Durable enough that it can survive some drops and dings, it’s suitable for ages 3 and up, though we really think the really young kids would prefer something softer. Being a mechanical toy, it’s not going to be as cuddly as regular stuffed animals, so if it’s a bedtime buddy that is needed, take a look at some of TOMY’s incredibly crafted Pokemon stuffies. Some users have said they wished it made some of the more sassy sounds that are so classically Pikachu, or at least the battle cry made during a Thunder move. Alas, this toy is not sassy or spunky but it IS quite cute. A few of the noises sound like a baby giggling, which a few users have pointed out sounds more like Tickle Me Elmo, but this hasn’t bothered any kids. Just be sure to flip the switch on the bottom of the toy to ON. If left on the demo mode, it only cycles through three sounds. Requires 2 AA batteries, which are included. A switch on the bottom sets the toy to off, demo, or on. Press the belly to make the ears move and activate one of ten sounds. Getting Pikachu out of the box may be almost as difficult as Ash trying to get Pikachu into a Pokeball. Numerous ties and plastic bits will require a good pair of scissors to get through, so plan ahead for this if giving the toy as a gift. Once out, look for the power switch on the bottom of the toy. It should arrive set to ‘demo,’ which restricts the noises to only three sounds. Setting the toy to ‘on’ allows for all ten sounds, a few of which sound like a baby giggling. While this sound is certainly cute, a few users have said that it sounds more like a Tickle Me Elmo than a Pokemon. Some really picky fans might not like this sound, so just switch the toy back over to ‘demo’ to keep it down to traditional Pika-speak. The ears move up and down when the belly is pressed, controlled by an internal lever. The mechanical parts can be felt through the padding when squeezed, but it’s not uncomfortable to give the toy a hug. Since the ears are controlled mechanically and not electronically, they don’t take up battery power. We’re also impressed with the durability of the ears. Kids can drop the toy or knock it off a table and the toy keeps a-tickin’. It shouldn’t be thrown around recklessly, but it can handle a few accidents here and there. Overall, this toy is pleasing fans of all ages. We recommend it for ages 3-8, though, because older kids may only want it for the purpose of building their collection. If that’s the case, then they don’t really need a toy that makes sound or moves. A plush or figurine may work just as well for older kids. The vast majority of users are thrilled with their Pikachu, though a few have noted that they wish it had more of the sassy sounds Pikachu makes on the show. This has not been a deal-breaker for buyers, though. 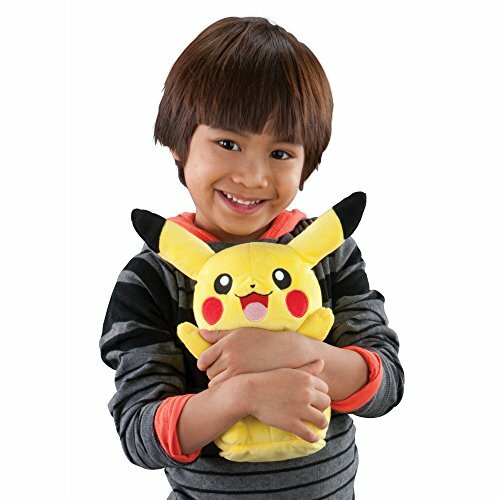 Become Pikachu’s Trainer with the lovable My Friend Pikachu plush! 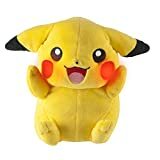 My Friend Pikachu laughs and talks! My Friend Pikachu is 10” high with a soft yellow fabric. Pikachu has adorable red circles on its cheeks and features over 10 fun sounds and phrases! Press Pikachu’s belly to make its ears move, its cheeks light up and to hear one of Pikachu’s signature phrases from the show!